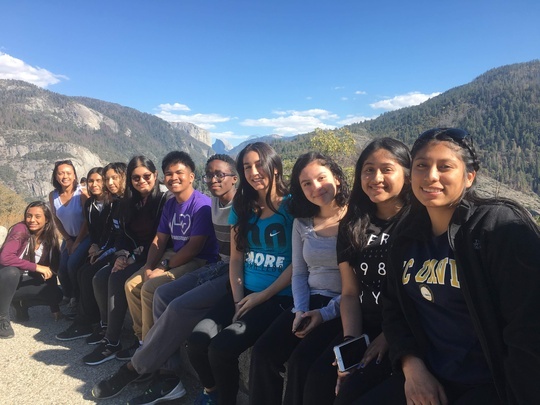 Health Careers Academy students and their chaperones returned to Yosemite this year for an amazing and challenging expedition in Hetch Hetchy!. 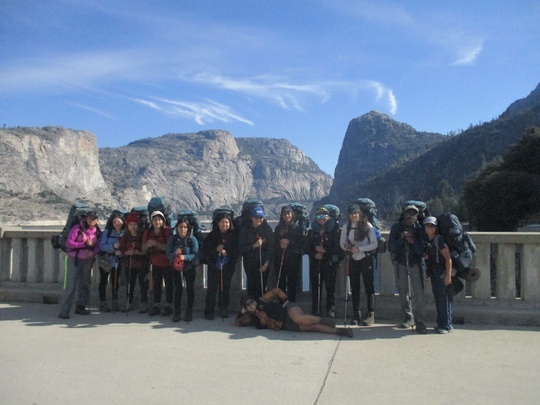 Health Careers Academy students arrived in Yosemite on Sunday with excited eyes and open minds. 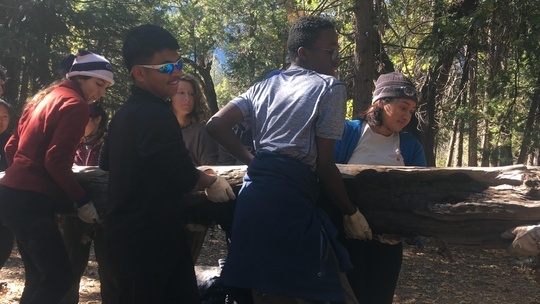 After an evening of getting comfortable and acclimating to their new classroom, they woke up on Monday feeling refreshed despite a chilly night in Yosemite Valley. On Monday morning, students met their NatureBridge educators and began the day. After gathering their things from their tents, they heard a flute coming from the nearby parking lot. They followed the noise, and it turned out to be Shelton Johnson, an accomplished and inspirational park ranger in Yosemite who was ready to speak to them. 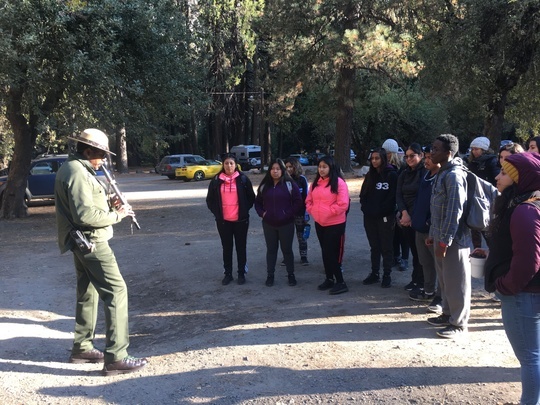 Students were wide eyed while learning about Shelton’s journey into the park service and accomplishments such as spending time with Barack Obama and camping with Oprah Winfrey. Later, they waved goodly to Shelton and began preparing for their wilderness adventure that would begin the following morning. They packed backpacks and participated in activities that prepared them to work as a team. 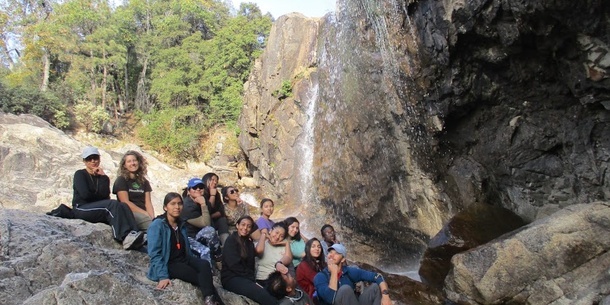 On Tuesday, the group headed out on a two hour drive to Hetch Hetchy, a beautiful but seldom visited part of the park that contains the primary water reservoir for San Francisco. 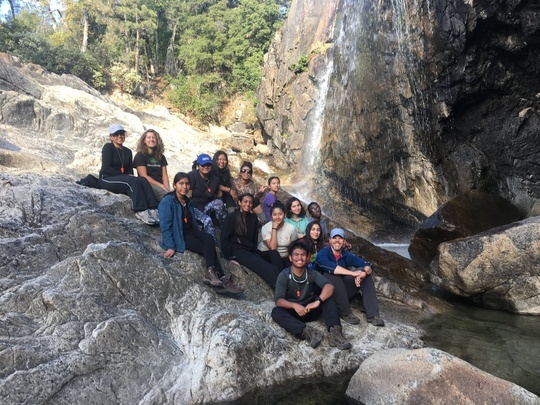 A challenging six mile hike led them to their campsite at Rancheria Falls, where they enjoyed mac n’ cheese and a good night's sleep. Wednesday began with a “take a stand” activity led by Wilderness Ranger PJ, which allowed the students to ponder their opinions on the presence of technology in wilderness areas. Later, PJ facilitated a stewardship project in which the students helped to dismantle and disguise campfire rings that were built too close to the trail. When she headed out in the afternoon, PJ left the students with a sense of personal responsibility for wilderness areas and public lands. The rest of the day was filled with science and exploration - the students reviewed concepts they learned in their biology class by exploring those patterns in the real world. After thinking deeply about science, the group decided to take a brain break and follow the river up to some waterfalls. At the falls, NatureBridge educators led a guided meditation followed by a journaling activity. The next day was the challenge hike - students packed their bags to head up to Le Conte point, which they could see towering above their campsite. After seemingly infinite switchbacks on the trail, the group headed off trail to scramble along a ridge to the peak. The group practiced off trail etiquette by spreading out to avoid creating a new trail. Each got to choose their own adventure to the summit, but supported each other along the way. The challenging hike resulted in feelings of accomplishment once the summit was underfoot. A long reflection and relaxing time at the summit refreshed the group for the hike back down to camp. They arrived after dark, quickly made dinner, and prepared to leave the next day. The group woke up extra early to pack, and headed out for their final hike of the trip shortly after. Another six miles took them back to the trailhead. After using real toilets for the first time in days, students reflected on the strength and power they discovered in themselves as a result of the trip. Quick stop at Tunnel View on their way into the park! Start of their grand adventure!